My family had an early birthday dinner for me. We had an italian feast. It was so delicious! Here's Kate helping me blow out my candles. After dinner we went cruising around on the razor scooters. Man, we are lame. Especially the baby chicks. She was on the verge of freaking out right here. Kate's first pony ride. She looked so cute on the baby pony. I couldn't really tell if she liked it or not, but it was sure cute to watch! My real birthday. I turned 27. Wow, I am getting old! 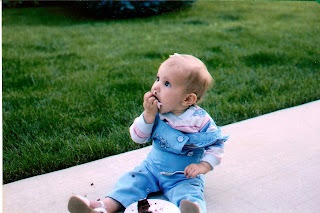 Here I am eating cake on my 1st birthday. Does Kate look anything like me? Paul had to work on my b-day, but we went to dinner at Carrabba's that night (my very favorite restaraunt). He surprised me and had a few friends there to celebrate. Thanks, Paul! 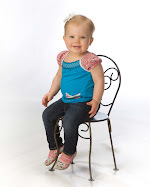 Thursday July 10th.... Kate turned 8 months today! I can't believe she is getting so big. She is learning so much and is just a little doll. Here she is shopping with me at Costco. She looks like such a big girl sitting up in the cart. I love to take her places with me. She is obsessed with looking at everyone that walks by, especially little kids. She gets so excited and gets a huge smile on her face when she sees kids playing. My little doll. She looked so cute in this little dress on Sunday. us? lame? riding scooters? i don't think so..
but these pictures are very cute and kate is so grown up. i wish i was there to see her in that cute dress! Those pictures are very cute. 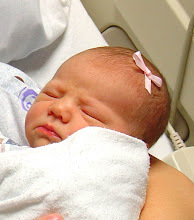 I can't believe that Kate has grown up so much and that I am missing it! It seems like you have been gone for 3 years! I can't wait for the babies to get together and play, they will have so much fun! I asked Wyatt which picture was kate and he got it right the first time! Yipee! Well, well, well. Paul has a baby?!! Hahaha. So awesome. You guys are the cutest little family. Love it. Happy belated Birthday! Looks like you had fun! 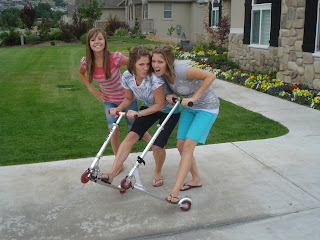 I think you 3 girls should be the new scooter models! :) Kate is so cute. My mom showed me the video she took of her cute chubby legs! SO CUTE! I just want to squeeze her! Wish we could have come up but it sounds like it was great. Hope all is going good! so cute. I miss you guys. How are you doing? Hi Heidi! It's me (Mindy Barry). Tammy found me and now I found you. 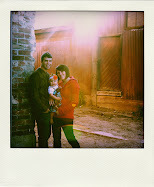 I love this blog thing! Happy belated birthday. I don't know if you how how long I kept your birthday written down in all my calendars. Well, of course you wouldn't know that. We haven't talked in like 12 or more years. :) Kate is so cute! I love her little chubby legs. I love her name too. I almost used the name Katelyn but decided on Ashlyn instead. well, this is getting long so I better go! Thanks for my new monkey pj's aunt tam!